Until the discovery of Kenyanthropus platyops there was only a single ancestor for modern humans in the early to middle Pliocene, namely Australopithecus afarensis. K. platyops ’ markedly different morphology warrants its classification as a new genus. Furthermore, Kenyanthropus rudolfensis had previously been classified in the Home genus but did not fit well into the group. K. rudolfensis was also too different to be classified as an Australopithecine. This new fossil find brings more diversity to our family tree. very different. K. platyops skull is characterized by small molar teeth, and a tall flat face. Platyops literally means "flat face." Lucy had protruding faces and large teeth. hominids. The different morphologies suggest it is possible that K. platyops and A. afarensis cohabited Kenya without competing for food resources. Following the same logic applied to O.tungensis, Meave Leakey argues that K. platyops may be a better link to the Homo genus than Lucy. redrawn to resemble a bush instead of a tree. Appearing 2.5 to 1.9 million years ago overlapping much of Homo habilis' existence, K. rudolfensis' browridges were less prominent than the australopithecus genus. The face is more prognathic, and the snout is less protruding. There is no sagittal crest; the large zygomatics, as in P. robustus and P. boisei, have disappeared. The molars, canines, and incisors are increasingly closer to the same size. The skull bones were thinner and generally more delicate. The average cranial capacity is 750 cc. Its body weight was approximately 50 kg, and the species was probably sexually dimorphic. Although none of its remains are associated with stone tools, its large brain indicates that it possibly manufactured tools of the early Oldowan tool industry. 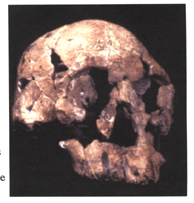 In many respects, K. rudolfensis was a little more advanced than Homo habilis . This could suggest that Homo habilis was a dead end, while Kenyanthropus rudolfensis gave rise to Homo erectus and all later human species. Kenyanthropus rudolfensis has caused paleoanthropologists to alter their views of human origins. There are many questions raised by its naming, which include its relationship to the australopithecines and Homo habilis, questions that cannot be answered based on such scant fossil evidence. Until new finds are made, these questions remain a mystery.